Big N Funky Productions: EGO PRO 9th ANNIVERSARY WEEKEND!!! Last year the EGO PRO Anniversary weekend was HUGE. 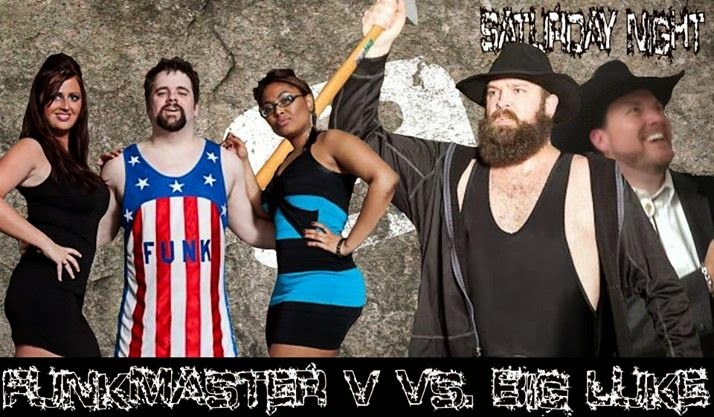 On Friday, Detroit Funk City Rolled out of a Funkmaster V's Uptown Cabs of RenownTaxi, hit the bricks and The Demon, Dwayne Windham, and Funkmaster Vtook out Brad Cash, Steven Cadillac Burns, and Tsunami Kid with the ole WEAVER LOCK for a win for the good guys. Even Scott Hall (Yes that Scott Hall) said the match was awesome. On Saturday, I defended the EGO PRO belt against Evan Turner in a match that created two monsters: Evan Turner and God's Will. And that's just my sorry azz. Come out to the Athens Armory tonight and tomorrow to see yuk yuks with actual talent!! !